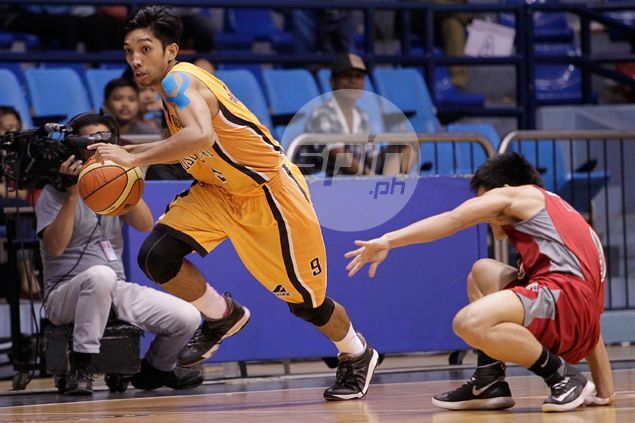 PHILIP Paniamogan could be another example of PBA aspirants reaching their dreams not through the draft. The undrafted shooting guard out of Jose Rizal University has gained the attention of GlobalPort after a solid showing for the Batang Pier in the Manny Pacquiao Cup in General Santos City. GlobalPort manager Bonnie Tan bared they are considering signing Paniamogan, who showed his wares in the D-League after going undrafted in the 2014 Draft. “He might get a chance to play in the PBA this coming season because of his consistent performance at GenSan,” Tan said in a text message to Spin.ph on Wednesday after the Batang Pier arrived in Manila. Only Roi Sumang has been signed to a contract among their rookie picks this year, the others being fellow guards Ryan Wetherell and Bong Galanza. Led by Paniamogan, the Batang Pier emerged champion in the week-long pocket tournament after going unbeaten against fellow PBA club Mahindra as well as commercial sides Montaña Pawnshop, Goldstar-Davao, and Air24-Davao. The Pido Jarencio-mentored dribblers capped off their stint with an 88-63 drubbing of the Enforcers on Tuesday on the way to pocketing the P500,000 top prize.